The outdoor living space has become an extension of our house. Homeowners are craving for additional ways to create an ideal open-air environment, as soon as the temperatures allow it. So while you are planning to put in a lot of time, money and effort for that perfect ‘outdoor living space’ you certainly want it to look good and fashionable. You can choose from the numerous umbrella options to get that extra visual detail! There are quite a number of outdoor umbrella designs available in the market that can convert your simple outdoor area into a stylish retreat. The cantilever is a stylish and unique umbrella that has gained more and more market share in the past years. Its popularity has grown from a niche product to a widely acknowledged product. While offset umbrellas are known for their unique look, quality and the ability to withstand any weather have made them popular all around the globe. They provide a visually appealing aspect to your outdoor environment by blending with any kind of design scheme and adding style to the mix. 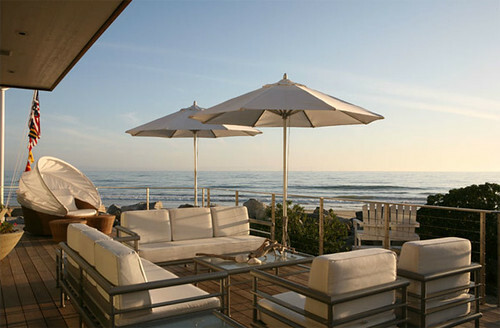 Versatility is another amazing factor with cantilever outdoor umbrellas. 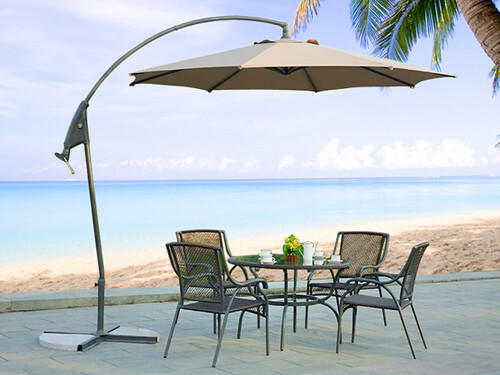 Whether lounging by your favorite water, be it the beach, lakeside or the backyard pool cantilevered side post umbrellas can adjust their shading canopy according to your position. While not all cantilevers have the same functionalities, the high end models go as far as allowing a 360-rotation. Turn your side post umbrella in any desired direction to protect you and your family form the sun! Done with the dining, where you have a pole right in the middle of the conversation. What’s more, you can enjoy a quick nap by positioning the cantilever near the relaxing chaise lounge. A cantilever umbrella would be appealing and efficient in any outdoor space. The tricky part with this kind of umbrella is the canopy being held from one side, therefore the load falls on only one side. The base needs a good strong design to keep the umbrella erect under all weather conditions. This makes it usually a little more costly compared to a conventional market umbrella. Some cantilever umbrellas are designed to use a plastic base filled with gallons of water to give the base extra bottom heaviness. These kinds are difficult to move as they are heavy and water will need to be drained to be able to move the umbrella to a safe place. Other designs use a cross base that can be used with patio stones or to be screwed into a wooden deck. A traditional central pole umbrella is called a market umbrella. These types of umbrellas were used mainly in the market places in the earlier times. However, nowadays market umbrellas are used in every possible location! Market umbrellas have different styles of canopies to them. A post with a canopy on top of it is the most common type of market umbrella. The size of the canopy can range from 6’ up to 11’ or more complete with unique custom bases or lever arms. These umbrellas are popular in pool side settings as they give a wide range of shade. Market umbrellas in a café setting are usually made with a heavy metal base. This looks attractive and is less bulky than plastic water bases, providing ample space for sitting outdoors. All advanced umbrellas come with some type of venting system on the top allowing hot air and wind to escape. Market umbrellas usually cost in between $80-150, while the most basic cantilevers start around $150.